Lumbar fusions, with replacement of the disc with implants leading to fusion and fixation with screws and rods, are sometimes unavoidable to treat lumbar disorders. This can for example be the case in spondylolisthesis, where a vertebra tends to slide over the lower one. Often this is due to disc degeneration, in younger patients it is an abnormal bone fusion that is the cause of the 'sliding'. To perform a classic lumbar fusion, a large incision in the midline of the back is made and the muscles are stripped off the bone and distracted. This inevitably causes major postoperative pain and a long revalidation period. Often the muscles do not recover well and this can cause persisting discomfort. To avoid major injury to the spine muscles, less invasive techniques, using in some cases percutaneous screw placements, have been developed. Instead of a midline incision, two small lateral approaches are made, dilating the muscle. The operation takes place through working tubes. 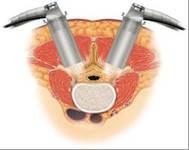 In this way, the muscle damage is limited and the same result can be obtained with less pain and shorter revalidation.